Not much is known about John London. He first appears in Bristol in June 1675 when he was made a free Burgess as a gunsmith. In July of that same year he took an apprentice, as a gunsmith, named Robert Sainsbury. In August 1678 he was married in Bristol to Mary Baker. And that is as much as we know about his life, being recorded only in that brief timespan of three years from 1675 to 1678. We know that he made clocks, but those few written details we have about him refer to him as a gunsmith. Anything else about him we can only deduce from those of his clocks which survive, and not many of those are known. Robert Sainsbury was made a free Burgess in November 1682. At that time we don't know if John London was still alive or was dead, but we can probably assume he was still living or Robert would have been transferred to some other master. That being so, we can add another few years to John London's assumed working life, making it a total of seven years! Of course, he may have worked on after 1682, but as yet we have no way of knowing whether he did, or, if so, for how long. Robert Sainsbury came from Market Lavington in Wiltshire, the son of another Robert Sainsbury, a yeoman. 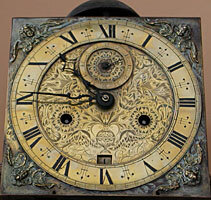 No clocks are known by Robert Sainsbury, though we might have expected that he learned to make those as well as guns. Market Lavington is a strangely interesting location, as being the place some of the very earliest clockmakers in south-west England originated. John Snow the lantern clock clockmaker worked in Market Lavington from at least the 1620s and died there in 1658. He probably taught clockmaker John Holloway, another lantern clock maker, who was born in Market Lavington about 1610 and worked there till he died in 1676, after which his son, Richard Holloway, continued the clockmaking trade there. These two Market Lavington clockmakers, John Snow and John Holloway, were the earliest to work in this region, working even earlier than the brothers John and Nicholas Snow(e) of Salisbury, who made lantern clocks there from about 1630, and were surely related to John Snow of Lavington, though we are not yet sure of the exact relationship. So Market Lavington was a centre, in fact almost the only centre, of early clockmaking in the West Country, and there may be some significance that John London took an apprentice from there rather than elsewhere. 1. The exquisitely-engraved dial of the 'John London of Bristoll Fecit' longcase clock is ten and a half inches square. A lantern clock then owned by Mr. Moore signed 'Jo. London Bristoll'. A lantern clock illustrated in George White's book 'English Lantern Clocks' signed 'John London of Bristoll', formerly with alarmwork. The butchered remains of a lantern dial plate illustrated in George White's book 'English Lantern Clocks' but later used in the making of another clock. This is all that survives of a clock signed 'John London of Bristoll'. An eight-day longcase with 'wonderfully-engraved' dial reported by George White to Jim Moore signed 'John London of Bristoll fecit' with large movement and one-and-a-quarter-seconds pendulum in its original case of plain-grain walnut. A single-handed thirty-hour verge-escapement clock signed 'John London in Bristoll' in its original walnut case sold by Bonhams Auctioneers in 2002 with lantern movement - in effect a cased square-dial lantern clock. George White also reported one which had been another eight-day longcase clock, but which now has a nineteenth-century chiming movement behind the dial and is housed in a marquetry case, so that in effect all that remains of this clock by John London is the dial. 2. 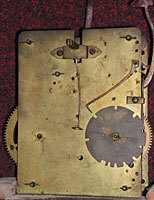 A view of the back of the movement, showing the outside countwheel and the very unusual feature of the pillars pinning from the back. Two empty holes lower right are where the hammer spring originally fitted, re-positioned later. The grand total therefore is five lantern clocks and three longcases, plus this present longcase example pictured here, making a total of nine surviving clocks by this maker, though we know there were at least another two since destroyed. His total known output reaches eleven clocks. We know an established clockmaker was capable of making twenty-five longcase clocks (or lantern clocks) a year, which means his potential output was at least 175 clocks even if his working life was limited to the seven years we already know about - and it may have been much longer. But of course those figures presuppose a full-time clockmaker and one whose business was established and had orders for all the clocks he could make. John London was just starting in business and may have found orders not that readily available. Moreover he was the first person to try to sell longcase clocks here, a type previously totally unknown in this region, with the possible exceptions of the gentry who may have seen and bought such things in London. This may account for the fact that by far the more numerous clocks known by him were lantern clocks. But probably the most important factor in this apparently low production rate, is the fact that he was principally a gunsmith, and it may well be that the great bulk of his time was spent making and repairing guns. His only known apprentice, Robert Sainsbury, described as an apprentice gunsmith, not a clockmaker, could quite possibly have learned the clockmaking trade from John London, yet seems to have produced no clocks at all, or at least none are recorded today bearing his name. And we must bear in mind that enthusiasts and researchers have been recording and documenting such things now for well over a hundred years! This may well indicate that Sainsbury was a gunsmith pure and simple and might further imply that this was John London's principal trade. Coming to this particular eight-day clock, the dial is ten and a half inches square and is one of the finest engraved-centre dials I have ever seen, featuring a wonderful array of flowers emanating from a central vase. Some of John London's other clocks also feature flowers springing from a vase. Not many clockmakers made this type of all-over engraved dial, and those who did more usually produced them for thirty-hour dials. It was a style fashionable only for a limited period in the last quarter of the seventeenth century, and several such dials use the flowers-from-a-vase theme. When they used this style on eight-day clocks, clockmakers often drilled the winding holes wherever they were needed without regard to cutting into the engraved design. It seems to me a terrible shame as well as a sign of poor craftsmanship to mar the dial in this way by piercing right through the engraved design, but this was done by some of the finest clockmakers ever to work in Britain -but not by John London! John London's engraving is designed purposely around the winding hole, seconds hole and square-box calendar aperture. This shows forethought and planning and an intent not to spoil a beautiful and no doubt very expensive dial by drilling through the design. This particular dial also features a lot of engraving around and between the corner spandrels, leaving not a speck of space anywhere unengraved. Very few clockmakers engraved around the spandrels. Even in its uncleaned condition this riot of engraving stands out as exceptional. This dial is signed 'of Bristoll', which he spelled consistently with two ls. Some of his clocks are signed 'in Bristoll', some 'of Bristoll'. The thirty-hour clocks, all being lantern clocks in fact, are mostly signed 'in'; the eight-day clocks are consistently signed 'of'. 'Of' might be his earlier way of signing, or it might be usual way of signing eight-day clocks, or it might just be a random use of either. Running through various books to try to compare this dial with others of this type, I could not find a better-engraved dial by even the finest makers in the land. Those who made longcase clocks with this type of dial (sometimes only a single clock is known with this type of dial by any particular maker) include the following London makers: Ahasuerus Fromanteel, his brother-in-law, Andrew Prime, Joseph Knibb of Oxford and later of London, Edward Stanton, Edward East, John Hilderson - there are not many of them. Provincial makers whose engraving quality in this type of dial approached John London's are: Richard Greenhill of Ashford in Kent, Thomas Power of Wellingborough in Northamptonshire, Jonathan Chambers of Shefford in Bedfordshire. The quality of the dials in question by these provincial clockmakers is so high, that the dials may well have been engraved for them in London. And the same applies to the dial of John London's eight-day clock. The movement is extraordinary, being an eight-day, but larger and sturdier than most, built originally with six pillars, though one pillar has been removed at a later date. We quite often find the odd pillar removed on clocks built with multiples of more than four. It is not clear why, but it may simply have been that later restorers felt that four (sometimes five) pillars were enough for any clock, and would take out ones they saw as surplus to requirements for the sheer value of the brass itself. The pillars are riveted into the frontplate and pinned at the back, which was the opposite from what became normal practice, but was done by some of the first makers producing longcase clocks at this very early period (1670s), such as Edward East of London. The clock was built with anchor escapement, though the present anchor is a replacement of what was presumably a worn-out original. The date of the invention of the anchor escapement is still being still debated by scholars, but it is generally thought to have been developed in its full form by 1670, probably by Joseph Knibb of Oxford - who incidentally is one of the makers mentioned earlier, who are known to have used this highly-engraved type of floral dial. We know from at least one dated clock that the anchor escapement was in use in the Bristol region by 1675. We would expect from the maker's known working dates that this present clock must date after 1675, and perhaps before 1682. But in any event various stylistic and mechanical aspects suggest a date in the late 1670s, which is consistent with what we know about the maker. Some clockmakers of this and later periods, who did make longcase clocks, used the verge escapement (in use by 1660), as did John London himself in his thirty-hour longcase clock numbered 3 in the above list. This means this clock is not only one of the first longcase clocks ever made in the West Country, but it must also be one of the earliest provincial clocks to have an anchor escapement. The clock has outside countwheel striking, which is the earliest form, followed not long after by the inside countwheel version. This feature would help us place this as amongst his earliest eight-day clocks, as at least one of the others is known to have inside countwheel striking. There probably are more John London clocks yet to be discovered, but I very much doubt that such a high production rate and such high numbers of clocks were ever made by John London as we know professional clockmakers were capable of making. Even so, I doubt we will we see another example as fine as this one illustrated here.